Turkey breast in a sweet glaze served with loaded mashed potatoes and vegetables. From my kitchen to yours since 1948. 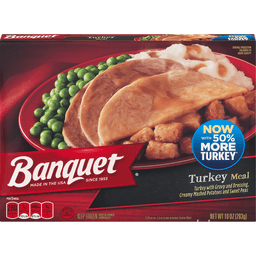 Premium turkey breast tenderloin. Inspected for wholesomeness by US Department of Agriculture. 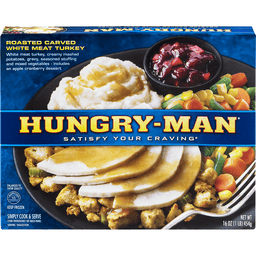 Per Meal: 350 calories; 4.5 g sat fat (23% DV); 860 mg sodium (36% DV); 9 g sugars. Marie's Story: For Marie, cooking was always about sharing her love and care through delicious, wholesome homemade meals. 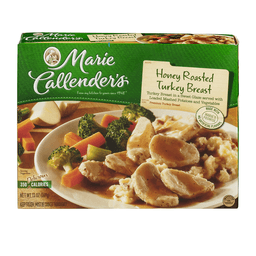 That's why for over 60 years Marie Callender's has made no compromises and filled her Honey Roasted Turkey Breast recipe with special touches and quality ingredients like premium turkey breast, creamy mashed potatoes, and farm grown vegetables. So every meal is truly a time to savor. Visit our website MarieCallendersMeals.com. Facebook: Connect with us on Facebook. Marie's Promise: No artificial flavors. how2recycle.info. Food you love. Questions or comments, visit us at www.mariecallendersmeals.com or call Mon.-Fri., 9:00 am-7:00 pm (CST), 1-800-595-7010 (except national holidays). Please have entire package available when you call so we may gather information off the label.